Don't tell me you have never been angered by words, actions or lack of actions of the world rulers or, politicians as we call them. I bet there were moments in your life that you had wished there was something around that you�d throw in their faces! Well, you have the chance now! 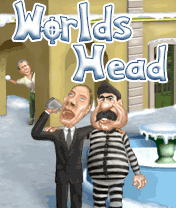 World's Head presents you with all the world rulers, Both legitimate and self-proclaimed. Well, show them what YOU think about how they are doing their job! Snowballs ready! Fire at will!